Citric Acid, Natural and Artificial Flavors, Sucralose, Acesulfame Potassium, Natural Color (Beta Carotene). Take 1 to 2 servings (7 to 14 g) with 6 to 8 oz of water per serving before Physical Activity, or anytime you need an Energy and Amino boost. ALLERGEN WARNING: Produced in a facility that also handles Soy, Egg, Peanut, Tree Nut, Fish, Crustacean and Shellfish products. For adult use only. Use only as directed. Ensure to drink enough fluid before, during, and afer exercise. Consult a health care practitioner prior to use; if you are pregnant or breastfeeding, if you have any known or suspected medical conditions, and/or if you are taking any prescriptions or OTC medications. Consumption with other caffeine-containing products (e.g. medications, coffee, tea, colas, cocoa, guarana, mate) is not recommended. This product is not intended as a substitute for sleep. This product contains milk by-products/derivatives. Do not use if packaging has been tampered with. Store in a cool, dry place and keep out of direct sunlight. Citric Acid, Natural and Artificial Flavors, Sucralose, Calcium Silicate, Acesulfame Potassium, Natural Color [Red Radish (Raphanus sativus, root) powder], Lecithin (from Sunflower). ALLERGEN WARNING: Produced in a facility that also handles Soy, Egg, Peanut, Tree Nut, Fish and Shellfish products. Produced in a facility that also handles Soy, Egg, Peanut, Tree Nut, Fish and Shellfish products. 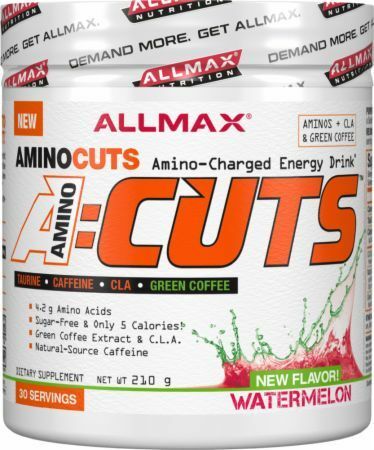 Jul 21, 2015 AllMax AminoCuts: Weight Loss Aminos with 725mg BCAAs? On your way to do some cardio? Need a mid-afternoon "pick-me-up"? AminoCuts is designed to fit your life and your diet, and is available in 4 mouth-watering flavors: Pina Colada, Goji Berry Martini, Pink Lemonade and Arctic Orange.